This gallery shares some of our beautiful custom master bedroom ideas. 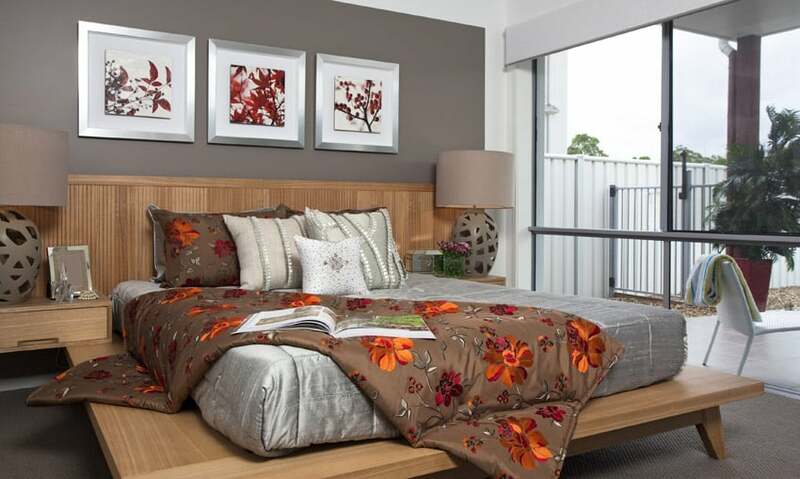 Creating an inviting and relaxing bedroom can take some careful thought and preparation. 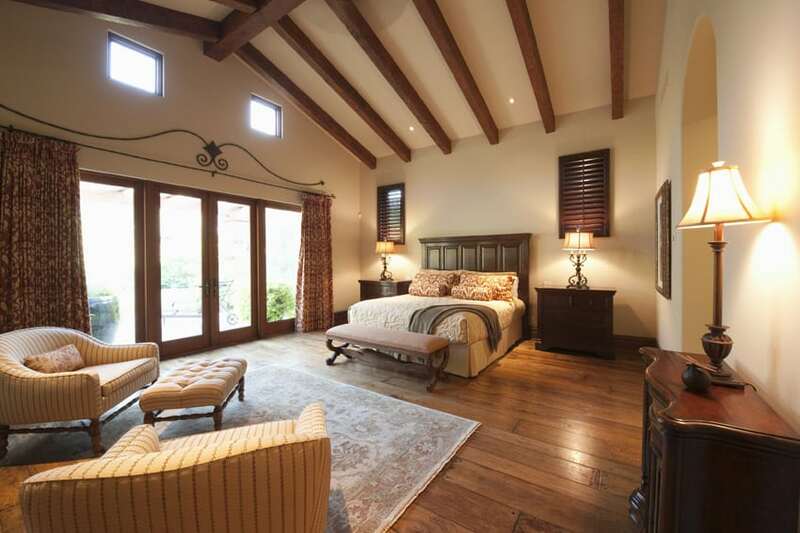 Below are a variety of master bedroom interior designs. You’ll find room decorating ideas, paint colors, furniture and layouts to help you find the style that’s right for you. We hope these bedroom ideas will inspire you to create the perfect bedroom sanctuary you’ll love. There’s a certain soft and feminine quality to this bedroom design – from it’s choice of colors, to its materials and the furniture pieces used. The color scheme are mainly soft neutrals, using variations of warm beige, combined with dark mahogany wood. The furniture pieces are very feminine, like the tufted headboard of the bed with plush velvet pillows and frilled bedding, to the velvet-upholstered loveseat and the antiqued mirror bedside tables. The soft and tranquil quality of this bedroom design can be largely attributed to the color scheme it uses. While this classic beauty adapts a mostly neutral palette, the cool emerald green accents, albeit in found in small quantities, helps add a refreshing spruce into this bedroom. The green tone also adds a cool and relaxing quality to this bedroom, further emphasized by its soft surfaces like the carpet floors and the soft corners of the furniture pieces used. A grand bedroom which is nothing short of elegant, but also makes an attempt to give it a more modern feel. Walls are in an oatmeal color while floors are textured white. Furniture pieces are on the heavy side – dark mahogany and wengue wood, tufted headboard in satin fabric, satin pillows and bed linens with tassel accents. The gray & white area rug use is a bit more modern, opting a geometric interpretation of flower petals, instead of a traditional rug design, updating the otherwise traditional appeal of the space. A bedroom which combines modern elements with heavy traditional furniture pieces. Walls are very simple and plain, devoid of even artworks adorning its walls. You will however see a small fireplace and a wooden mantel. Most of the attention is taken by the solid oak floors, its texture unhindered by furniture pieces or area rugs. The space is sparsely furnished, giving you a lot of open floor space to experiment on, but the furniture used are all heavy. A solid maple bed with matching maple bedside tables, an upholstered velvet bench, an upholstered armchair and a solid maple side table beside it. The elaborate patterned bed curtain makes a dramatic impression in this traditional style bedroom. Long legged French style bed stands and a decorative makeup table faced by an ornate mirror give some classic elements to the space. A large cushioned ottoman makes an attractive furniture piece at the base of the bed. Master bedroom ideas for creating drama and romance can use a bed curtain to inexpensively achieve the look. A bedroom that combines modern design with Moroccan design accents, it uses simple finishes and a simple white and antique gold color scheme. Walls are plain off white, while the headboard wall has a unique Moroccan-inspired arc niche/recessed wall. 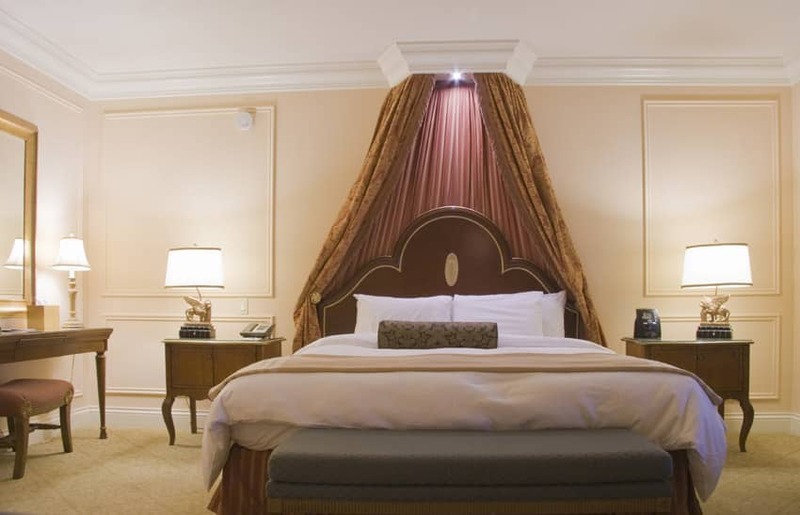 The bed itself is a four-poster bed with gold and sheer white drapes, complementing the gold throws, accent pillows and curtains. An amazing glass chandelier adds a dramatic flair to this bedroom. The room features a traditional style with the use of patterned upholstery and furniture pieces in a variety of colors and contrasts. 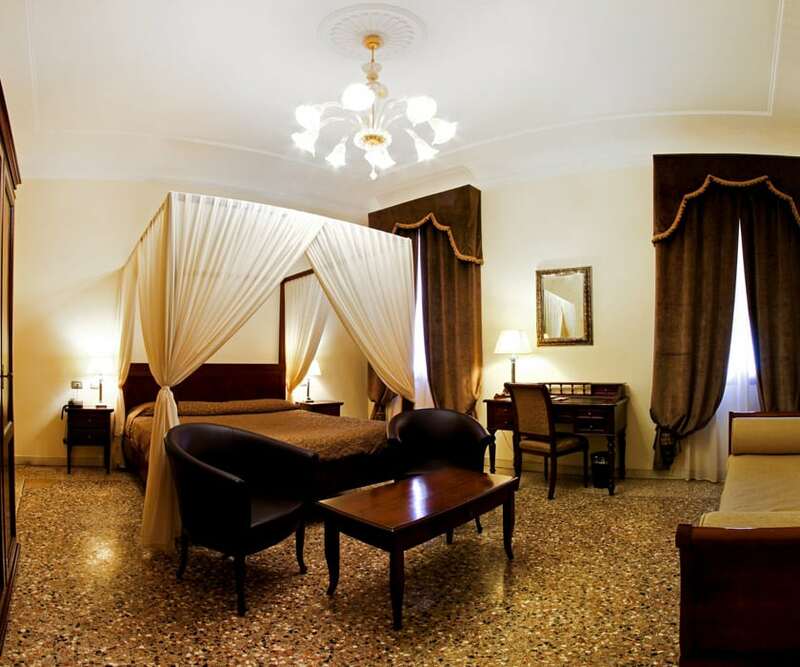 The design style of the room is whimsical and gives a sense of romance and adventure. The consistent use of dark wengue wood finish makes this room look well-put together and give it a somehow bolder appeal. Most surfaces are of neutral color – white walls, maple wood floors and maple-colored ceiling, making it easy to use darker colors. Because of this, dark wengue was consistently used throughout the space – on the shutters, bed frame, side tables, coffee table, ceiling trusses and even the legs of the love seat. To keep things looking bright and refreshing, furniture pieces are usually white, with accents of light cream/beige/gold and light green. 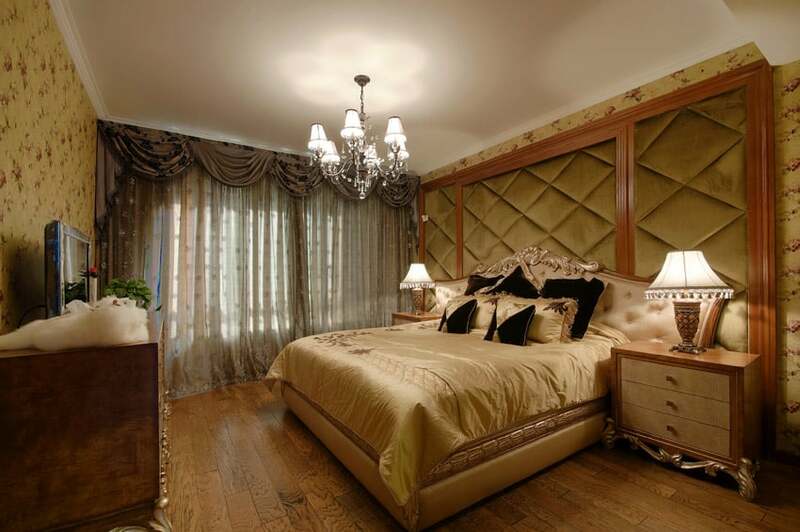 This bedroom has that elegant palatial look, which uses luxurious finishes and materials. Floors are parquet, while walls are paneled. On one side, you will see the white framing on the paneled wall, with gold details an lilac fabric wallpaper with a gilded relief artwork on its center. The wall in which the bed is set against has panels covered with fabric wallpaper with nailhead accents. 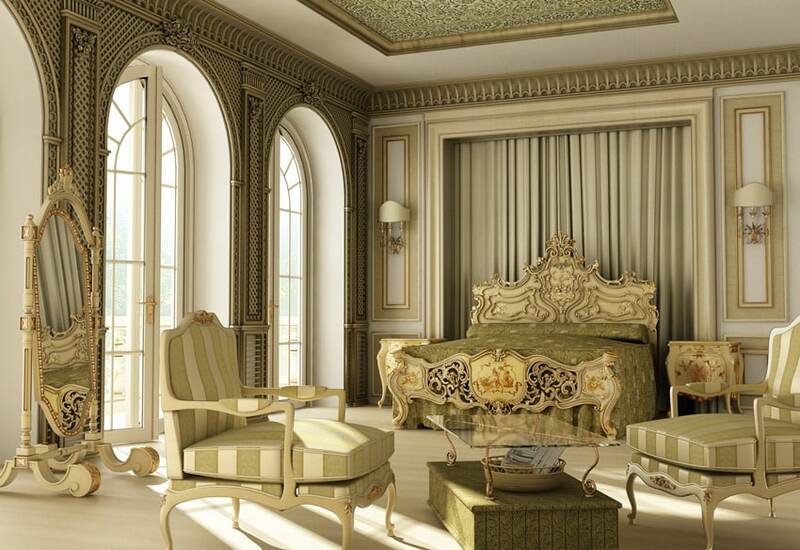 The furniture pieces are of classic Rococo period style, gilded in gold with light/pastel fabrics to complement it. Above the padded headboard of the bed are heavy draperies in a light purple color matching the lounge chair pillows and the fabric wallpaper on the side, further adding to its feminine charm. 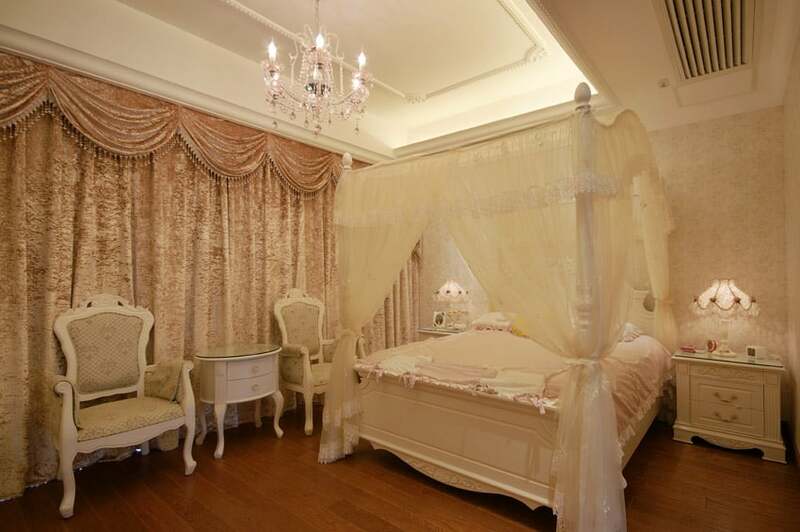 A bedroom which definitely exudes the feminine charm of classic bedroom designs. The color scheme is a lovely mint green combined wit a soft pink, creating a light and sweet, charming atmosphere for the bedroom. Floors are carpeted with geometric designs in green, blue and pink, following the color scheme, while the walls have green wallpaper with gold patterns. The heavy window drapes used matches the color and patterns of the wallpaper, making it look seamlessly matching. In the middle, accent drapes were hung above the white bed with gilded carved details, with fabrics in green pink and white. 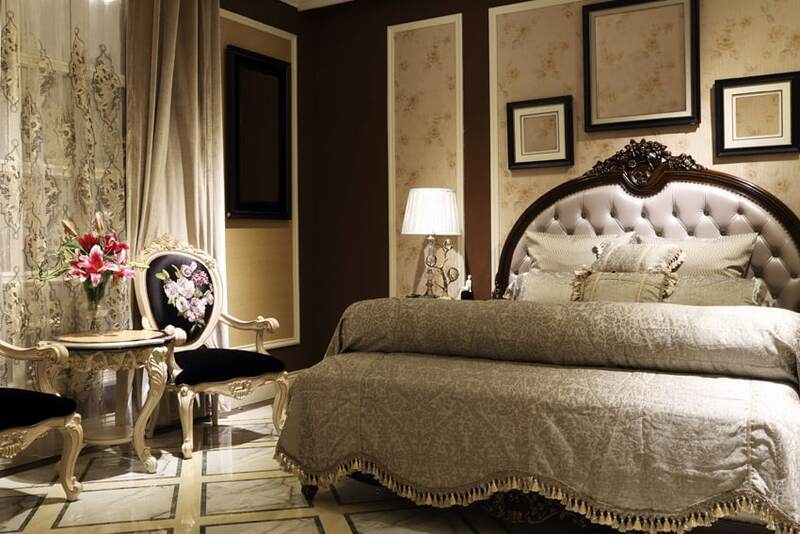 On each side of the bed is a pair of white night tables with lace lamps, furthering the feminine look of this bedroom. 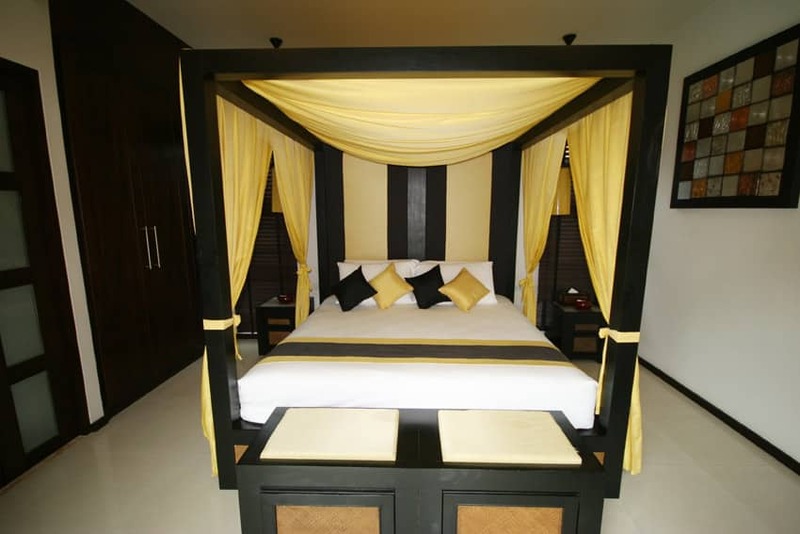 This bedroom has a very nice combination of light and dark colors – black, navy and yellow. The combination is pleasing to the eye and creates a gender-neutral space. Walls were lined with yellow linen wallpaper, adding texture to the surface, while windows were framed with royal blue grommet curtains. 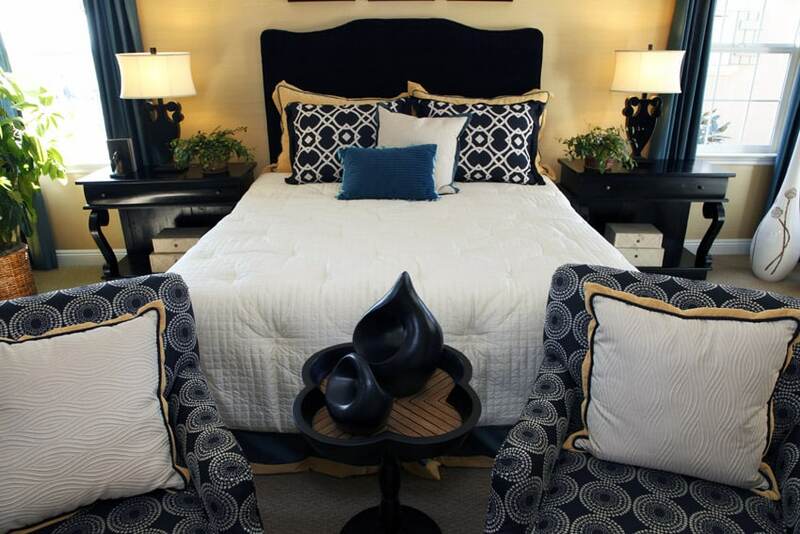 In the middle lies the bed with black padded headboard, with white covers and a combination of black, yellow and blue pillows. At the foot of the bed are two armchairs with navy upholstery with white geometric patterns and a very unique clover-shaped side table in the middle. 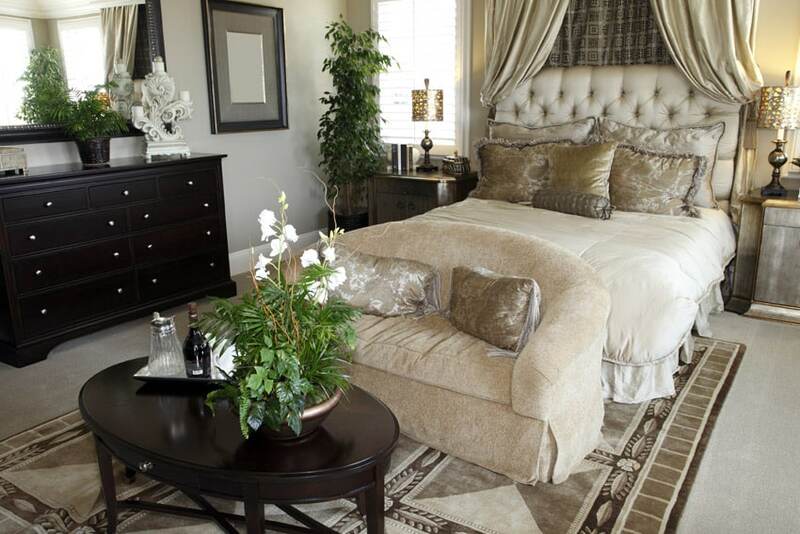 The composition of the bedroom is very balanced, and the excellent choice of color tones keeps it looking dynamic. Asian an modern design really complements each other, and in this example, you will see the obvious oriental Asian inspiration in this bedroom. The space itself is modern minimalist, with beige carpet floors, white walls and taupe accent wall. The bed is a raised platform bed in natural maple wood with built-in side tables and low wooden headboard spanning from end to end of the side tables. The vertical slats used on the headboard adds a little variety to the mostly horizontal elements of the space. 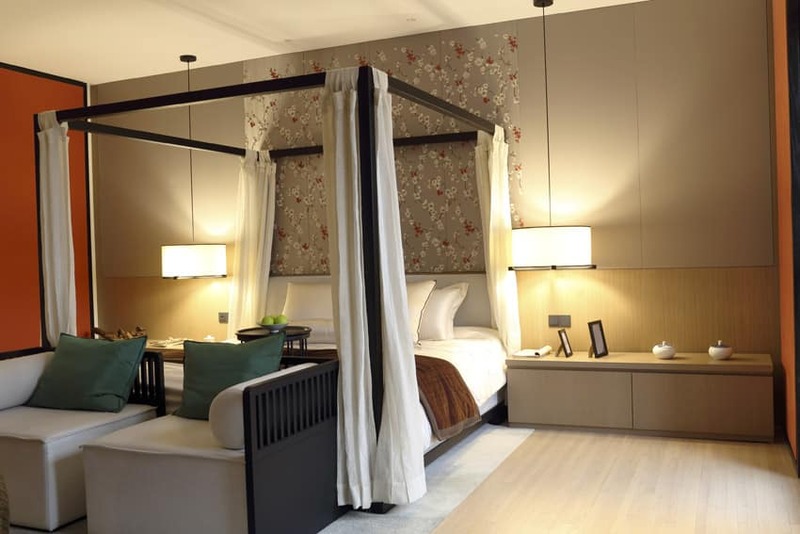 The bed itself if simple – with gray satin covers and oriental-inspired floral throws and pillows in light brown. 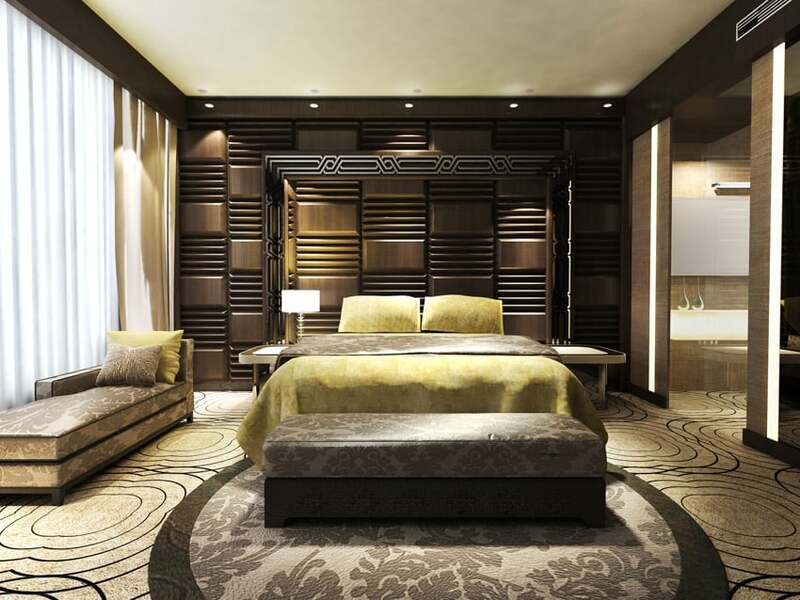 Following simple yellow and brown color scheme, this bedroom gives the luxurious feel of hotel rooms. The most iconic element of this room would be its accent wall. It has wooden panels with alternating slats and plain beveled wood panels, adding texture and depth to the wall. Because of the unique and bold accent wall, this wall also serves as the headboard of the yellow-covered bed, and a very large frame serves to emphasize the bed area. At the foot of the bed is a simple storage bench with brown brocade pattern seat cushion which is the same pattern used on the round area rug and the lounge chair on the side. Master bedroom ideas that use heavy accent walls can soften the design by bringing in neutral colors. Color scheme used for this bedroom design offers a cool and relaxing feel, reminiscent of the ocean breeze. The combination of blue and green is a cool welcome to the eyes and gives a cool, yet relaxing vibe. Flooring used is off-white carpet, combined with plain white walls. The bed is solid oak sleigh bed with powder blue bed covers and green accent pillows. At the foot of the bed is a fully upholstered bench with tufting which uses green & blue brocade pattern fabric. At the other side of the bedroom is a small seating area with green L-shape sofa and square ottoman upholstered in blue with white geometric pattern. This is a simple bedroom design which draws your attention into the bed because of its heavy massing. The color scheme is the basic beige combined with cool grays, creating a unique combination of cool and warm colors. 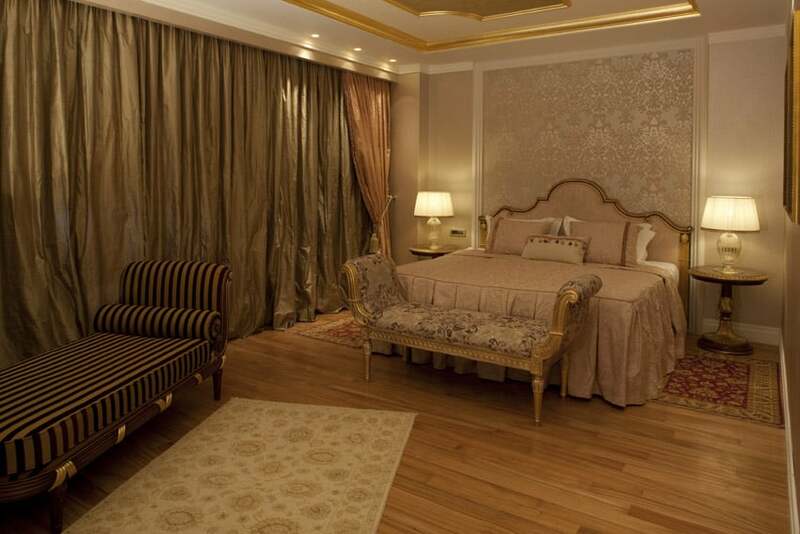 Walls are in beige, and floors are carpeted in a paler beige color, setting a light and neutral background for the heavy mahogany wooden furniture pieces. The bed covers and pillows are well coordinated, in a combination of brown, beige and cool gray. This is a very interesting bedroom because of its finishes. You will see that the wall with doors and windows is made of solid timber and keeps its natural orange finish, creating a log house look. The ceiling also adapts the same material and finishing, while its floors uses darker oak planks. The most interesting finish, however, is the headboard wall. The wall keeps a rough concrete finish, and the center has faux masonry cladding in a gray tone matching the concrete, adding depth, interest and a lot of texture into the wall, as well as giving it a raw, outdoor feel. The furniture seems to also adapt the natural look of the rest of the room, using natural timber as well, and keeping its covers and quilts plain white, giving way to the variety of natural colors and textures in the room. The high headboard of the bed basically draws your attention to the it, making it the focus of the entire room. The room itself has plain finishes on walls and floors, and the large, chocolate-colored velvet headboard seems to bring your eyes to it. Adding variety to the whites and browns are dark greens found on the traditional rug, as well as the pillows, plants and the upholstered accent chairs. The greens and browns in this bedroom blend naturally, creating a relaxing and color scheme which adds a slight natural/tropical feel into the room. The indoor plants used in the design is definitely a welcome addition, as it brings life into this bedroom design. This bedroom has an interesting mixture of furniture styles and colors. The color scheme uses dark colors, giving the bedroom a cozy and private feel – brown, purple and orange are the colors of choice. First off, the flooring is an interesting combination of black mosaic tiles serving as the border for dark purple carpet flooring in the center. 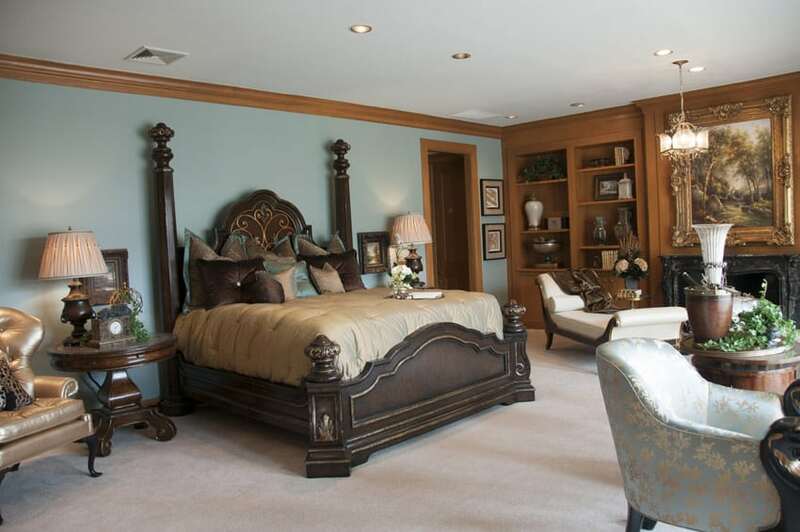 The walls are a subdued mocha brown color, giving a warm and cozy atmosphere to the bedroom. The four-poster bed is also finished in dark wengue, as well as its pair of night tables. Interestingly, at the foot of the bed is an outdoor-grade love seat with orange checkered seat cushion and violet pillows, 2 leather-upholstered ottomans and a tufted bench opposite the loveseat. The odd combination of furniture pieces is interesting and refreshing at the same time. This bedroom has that classic romantic appeal to it. The finishes of this bedroom is really simple, plain yellow walls with white baseboard and solid maple flooring, but the furniture pieces used is what gives it more personality. 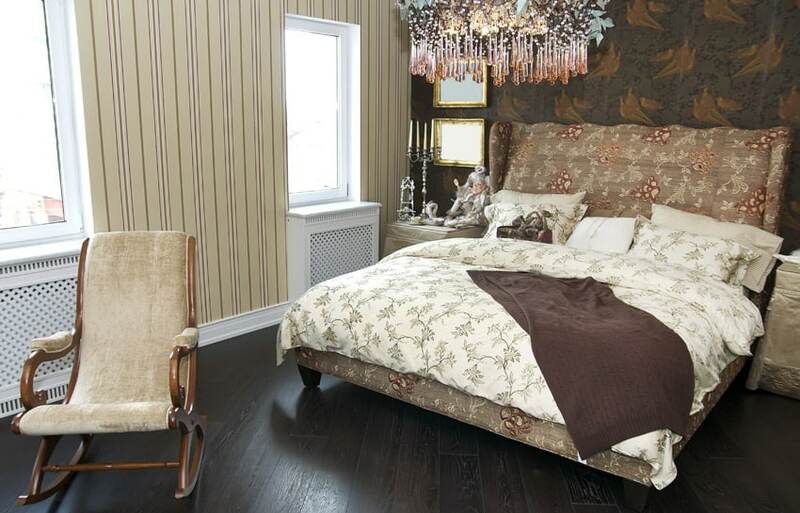 The bed used is wrought iron bed and uses off-white sheets and accent pillows. Above the bed is a gold-framed artwork & a pair of gilded wrought iron candle holders. 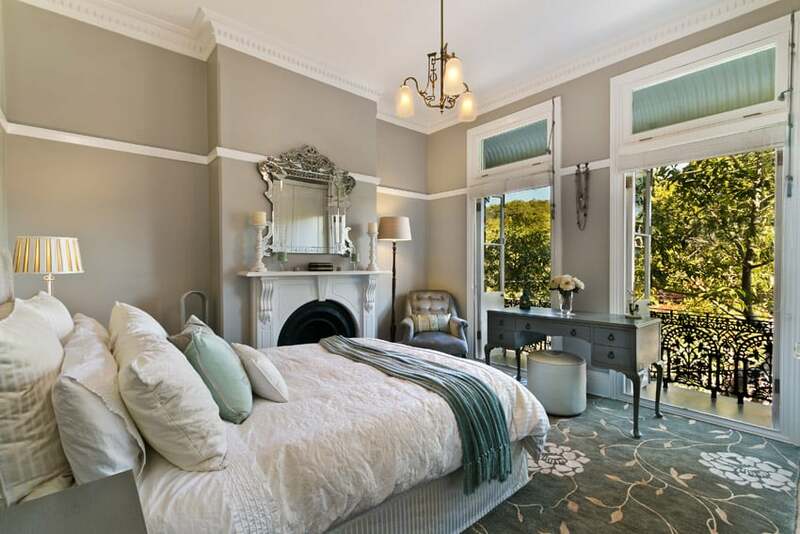 Beside the bed are mismatched bedside tables, one rectangular with wood carvings and the other is round with white fabric covers, and at the foot of the bed is a pair of white accent chairs and a round side table with wrought iron legs. 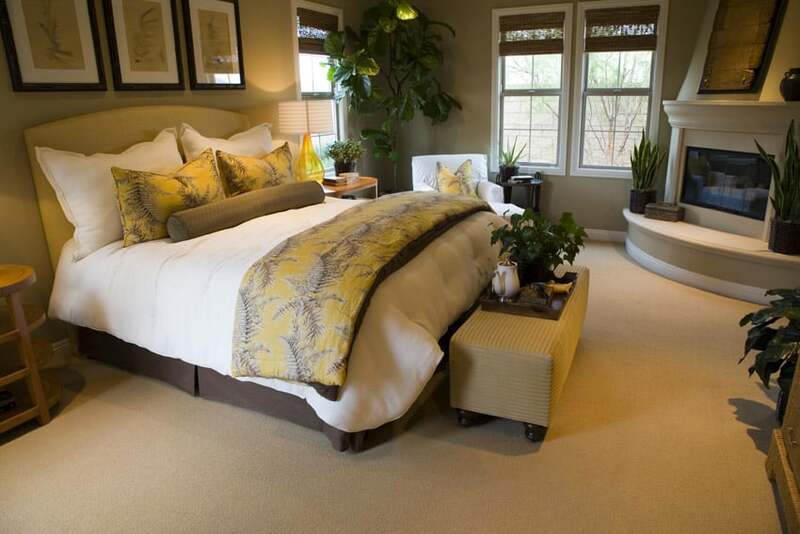 The large off-white area rug beneath the bed tones down the yellows of this bedroom. 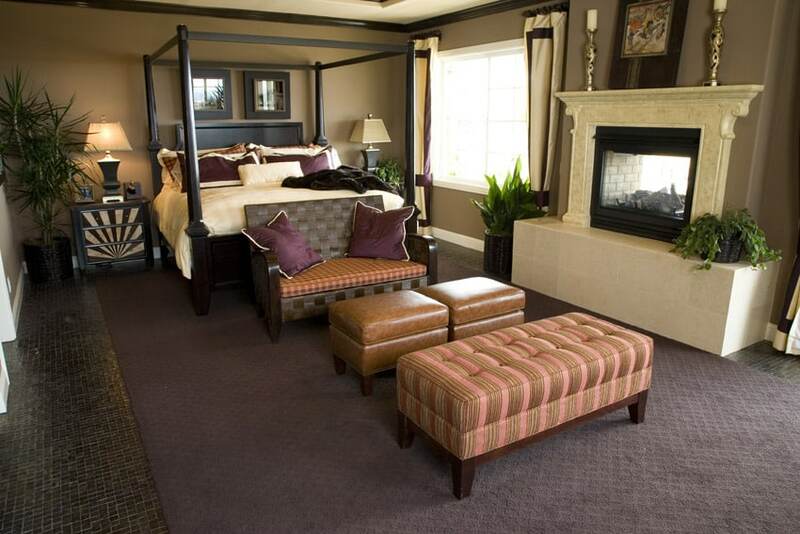 Going all-out with plush fabrics and carpets, this bedroom exudes ultimate comfort and luxury. Walls are lined with silver wallpaper with gray brocade patterns, and the wall at the head of the bed uses an even more luxurious finishing. This wall serves as an accent wall, the main accent wall panel as concealed accent light, further giving focus to the heavy brocade pattern on the wall carpet tiles. This is framed with wengue-finished moldings, and on each side of this are stainless steel horizontal panels framed in wood as well. The bed is silvered with matching night tables, and its headboard is tufted with velvet fabric in taupe and gray, matching the silvered bench at the foot of the bed with the same taupe upholstery. The side of the bed is a classic fainting chair with blue velvet upholstery and white framing with gilded carving details. Rococo interiors give a timeless feminine & luxurious appeal to any bedroom. This bedroom is a good example of such. Golden oak floor is combined with pale pink wallpaper. Baseboard & cornice are white, while the ceiling moldings are painted in a metallic gold color. The headboard wall is accentuated with white framing, and the wall itself is slightly raised and has a pale silver blue and gold brocade-pattern wallpaper, making it look like an over-sized artwork. The bed has a unique headboard with pale pink and gold upholstery matching the bed sheets and pillows, and at the foot of the bed is a gilded bench with brown floral upholstery. Beside the bed is a par of gilded round pedestal tables with a matching pair of silver table lamps. The large windows are covered with bronze and pink satin black-out curtains. 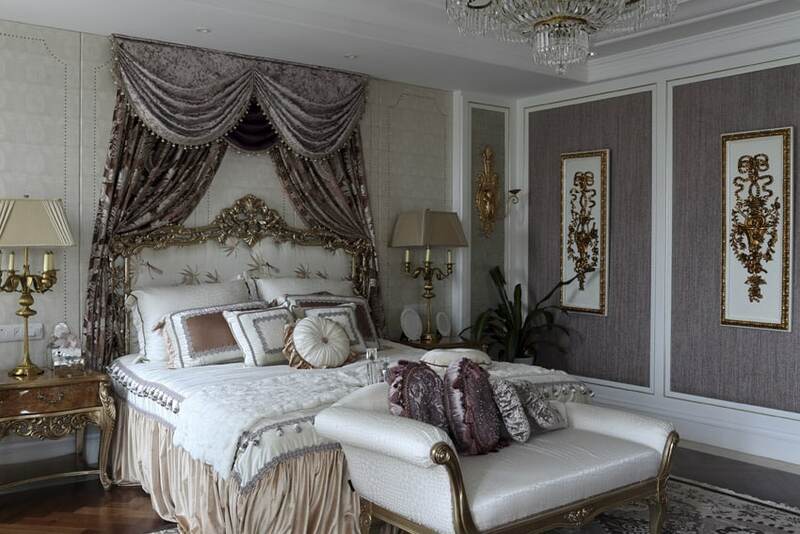 This is another example of a very feminine bedroom, only that this one has a younger, more dainty appeal to it. The floors are engineered pine, giving it an orange tinge, and contrasting it with the very subdued wallpaper in white and very pale purple on the walls. The large windows are covered with heavy velvet drapes in a pale rose pink color, while all the wooden furniture pieces were painted in white, giving it that dainty appeal. 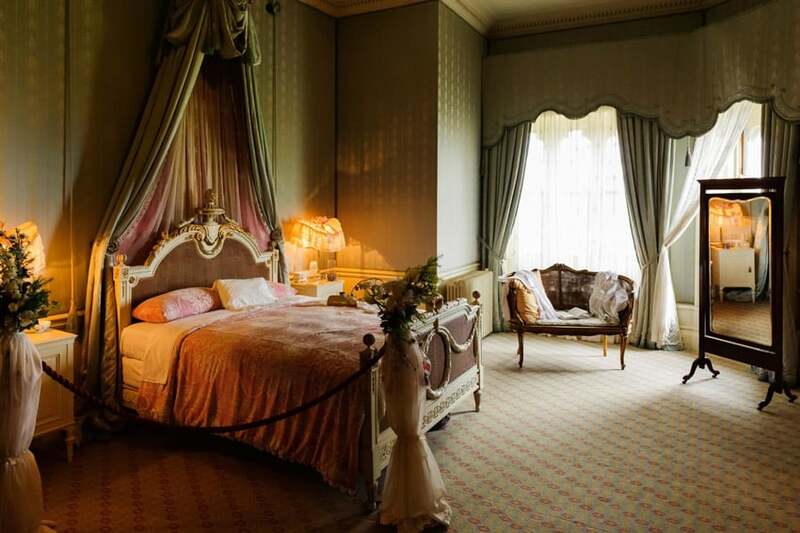 The bed is a four-poster bed, with baby pink covers and sheer white drapes, giving it an innocent appeal. Furniture pieces used in this bedroom somehow has that heavy look typical of classic wooden pieces, but its blue walls help lighten up the heaviness of the combination of woods used in this bedroom. The bed is solid wood in mahogany with 2 ornamental posts and aged gold detailing and has a variety of pillows. Solid wood pedestal tables serves as its night tables, and there is also a satin-upholstered armchair on the side. This bedroom also has a fireplace, and its walls are clad in golden oak and also has bookshelves. There is another seating area at the side near the window, as well as a rubbed bronze lounge chair upholstered in white near the fireplace. 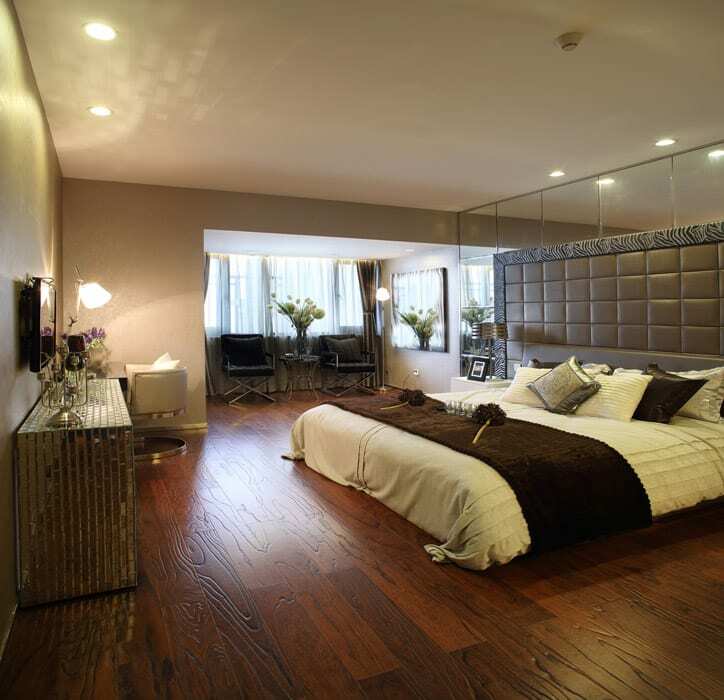 A large modern bedroom which demonstrates excellent layout and balance of depths and colors. As in typical modern designs, floors, walls and ceiling are kept in very plain colors: the floors & ceiling white, while most of the walls in a soft oatmeal color. You will notice how depth is played upon, using the column on one side and mimicking it on the other side, creating a “recess” to accentuate the bed wall. This is further emphasized by painting this wall a darker brown shade, and this technique is used on the TV wall in this bedroom as well. The high ceiling of this room and exposed wooden trusses makes this bedroom look extra spacious, extending white surface of the walls vertically.The floors are a nice golden walnut, and the furniture pieces are classic heavy wooden pieces, like the mahogany bed with matching side tables. The wood of the floors complements the light wall surfaces, but still offers a nice contrast with the dark wood of the furniture pieces.At the foot of the bed is a small wooden bench with pale pink upholstery and a pair of white striped armchairs with matching ottoman and is framed by the pale-colored traditional rug. Using cool neutral colors, this bedroom offers a relaxing and gender-neutral design, at the same time, uses an excellent combination of furniture pieces and materials. Despite the cool tones of grays used on the walls and the chevron accent wall, its solid maple floors adds a warm touch of color to the space and helps give it a brighter appearance. The floor plan is setup with the upholstered bed standing in the middle of the room. The bed has a high headboard in gray, and has two dark-stained solid wood bedside tables which has a retro appeal. The curtains used has 3 colors combined horizontally: white, beige and gray, which is basically the main colors of used in the bedroom. This is another transitional bedroom design which has a very feminine appeal. Walls are of a very light oatmeal color, while floors are carpeted in a soft beige tone, setting a nice light background. The bed is fully upholstered in white leather, with a tufted headboard design and uses purplish beige bed covers. At the foot of the bed is a brown velvet-upholstered bench with diagonal tufting adding to the feminine appeal to the bedroom. Since the bedroom has a small floor plan, the sliding doors of the wardrobe is mirrored, and even the night tables used are mirrored, helping create an illusion of a bigger space. This bedroom is a true classic in every aspect – from architectural finishes and detailing, up to the furniture selection. It also follows a consistent color scheme of sage greens, pale yellows and light beige. The walls itself already has a plethora of colors and patterns, but its faithfulness to the color scheme helps it look more coordinated than chaotic. The bedroom looks very grand placed against pale sage green curtains, its beige-painted carved wood prominent against its backdrop, and the sage bed covers a bright refreshing touch. 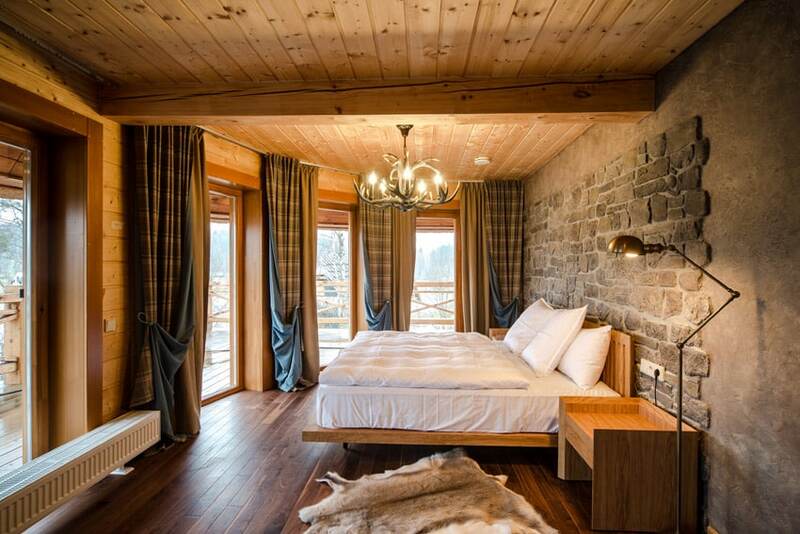 This bedroom is unique as it is placed in the attic area, yet doesn’t have that typical dark and cramped look attributed to attic rooms. Instead, this bedroom feels quite spacious, mostly due to the large windows, making the room look bright despite being small. An attic bedroom floor plan can be difficult due to the unusual dimensions. When dealing with sloped ceilings or unusual angles its important to select furniture that will fit in the space comfortably. Floral patterns doesn’t always make a room feminine, and this bedroom design shows how you can use floral patterns and still maintain a gender-neutral look for you bedroom. The walls of this bedroom are paneled, with chocolate brown base color and center panels painted in yellow-beige. The headboard wall, however, uses a light cream wallpaper with pastel yellow & green floral patterns on the center panels. At the center is the large mahogany bed with arched and tufted headboard which is paired with light taupe brocade patterned bed covers. On the side of the windows is a pair of armchairs in white, with black satin fabric upholstery, in which the backrest uses the part of the fabric with large floral print. 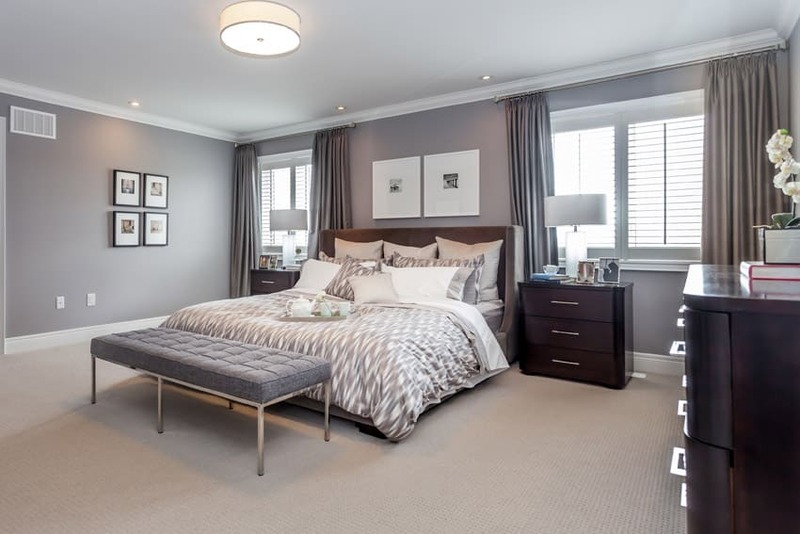 This bedroom combines modern interior finishing with classic and heavy furniture pieces. Floors are light maple chevron pattern parquet, matching the light beige paint of the walls. The accent wall features three vertical panels in pale lavender, with similarly-sized full length mirror panels on each side. For the furniture pieces, all are in silvered finish, and complemented with satin upholstery, adding sheen and reflective quality into it as well. The night tables are silvered and mirrored, which seems to make it blend into the mirror background. This bedroom has an interesting mix of furniture pieces and colors. Floors are carpeted in a neutral taupe color, while the walls are painted in a cool green color. The headboard wall has a unique wallpaper with faux stone masonry design, adding an interesting “texture”in the bedroom. The bed has velvet-upholstered headboard in gray, while the bedding cover and pillows is a combination of silver, white, purple and green. A pair of heavy dark walnut nite tables lay on each side of the bed and at the foot of the bed is a matching storage table. This is another classic bedroom which has an interesting combination of sage green with teak. The combination somehow brings an earthy feel to this bedroom, but also brings forth a relaxing quality due to the subdued colors. You will see that all walls are lined with sage green wallpaper with floral patterns, but this feminine element is neutralized by the massive accent wall panels framed with heavy teak and has green velvet tufted padding. The bed itself is tufted as well, ans is silvered, matching the legs of the teak bedside tables. This is a simple modern master bedroom with a pleasing combination of colors, creating a timeless appeal and a gender-neutral look. Floors are carpeted in a light beige color, while walls are painted in light gray. 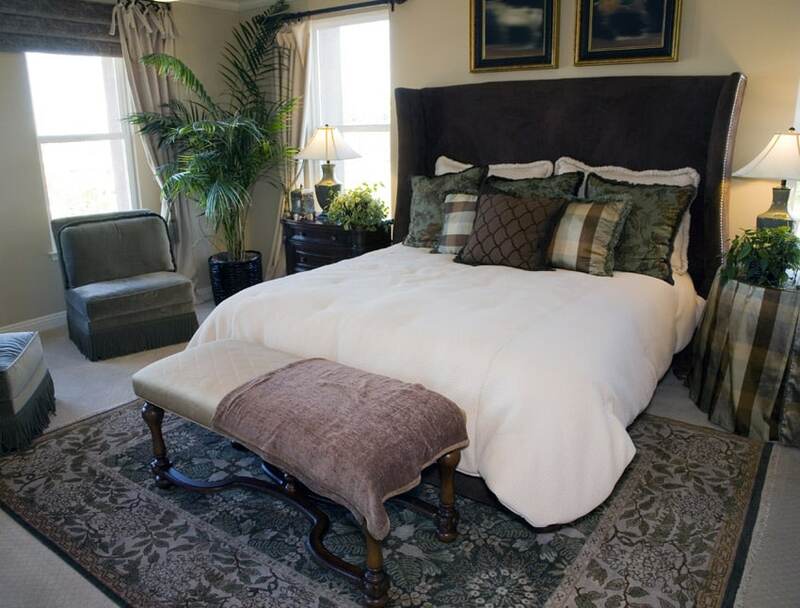 In the middle of the room is a wing bed upholstered in mocha brown velvet with white and light taupe bedding. At the foot of the bed is a modern bench with square tufting in gray and with stainless steel legs, and to complement the bed is a pair of wengue nite tables with a matching wengue commode dresser. Another Rococo-period-inspired bedroom which uses less feminine colors, creating a more gender-neutral space. The walls are a soft yellow while the carpet floors are in light beige. The valence boards are covered in a light yellow fabric matching the fabric of the tufted headboard. There are golden yellow accent pillows to add a touch of brighter color to bed, and at the foot of the bed is a classic fauteuil with medallion pattern fabric in lime and yellow. This bedroom uses a very beautiful combination of black, white and rust browns. The wall is a nice shade of chocolate brown, setting a dark and cozy atmosphere in the room. The bed stands out from this dark background with its white tufted headboard, framed with solid wood in dark wengue finish, matching the pair of nite tables beside it. At the foot of the bed is a simple bench with rawhide upholstery, which somehow helps put together the whole look. This is a simply designed bedroom with a masculine appeal, but maintains a bright and airy over-all feel. The floors are solid wood and is paired with beige walls and large windows, while the wall behind the bed is painted in a mocha brown color, giving the cream headboard emphasis. At the foot of the bed, a solid walnut desk was places, creating a space-saving layout for this small bedroom. To give it that masculine look, black items such as curtains, throws, pillows and area rug were used. Pale lilac walls sets the over-all mood of this bedroom, but the most interesting aspect of this design would be its layout. Typically, beds are placed against a wall or an accent wall, but in this case, it is placed against a half wall, which acts as a partition between the bed and the wardrobe. The closet/cabinet is the piece that occupies the whole wall and is partially exposed, adding an interesting element into the bedroom. The bed is has silvered framing with padded headboard, which matches the large framed mirror on the side wall. This is a transitional style bedroom with soft beige walls and floors, setting a soft and warm background to work on. You will see that the accent color used in this bedroom is yellow, which gives a happy and positive energy in this bedroom design. Various shades of yellows (or beige with strong yellow undertones) were used , and in combination with the greens found in the indoor plants, it creates a natural relaxing atmosphere. 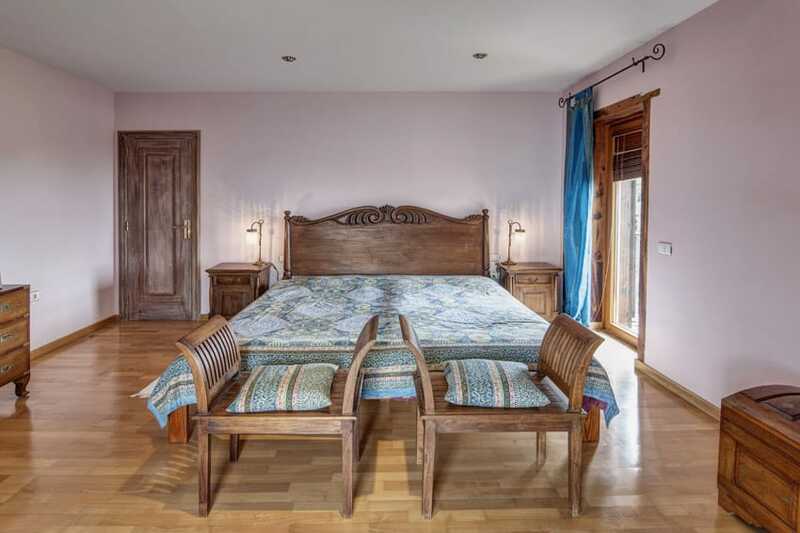 This bedroom features wood parquet flooring, traditional wood furniture with matching bed stands and a cushioned headboard. 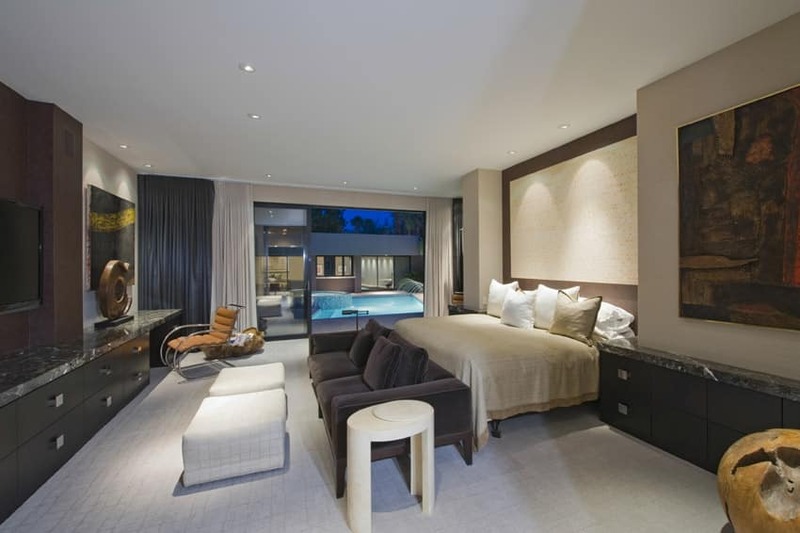 The room provides a warm feel due to the use of rich browns and pops of white on the bed cushions and drapery. A combination of modern simplicity with the warm and cozy look of country design, this bedroom has that warm cozy feel without going overboard with decor and patterns. Floors are clean white, while walls are painted in a light yellow tone, adding to the warm look of the oak wood ceiling. You won’t see any accents on the walls, and the floors are also plain, with no additional area rug, which helps compensate for the heavy wooden furniture pieces used in the room. The bed is golden oak with 2 ornamental posts and a matching pair of night tables. There is also a storage cabinet using the same finish of wood an a white upholstered lounge chair near the foot of the bed. This bedroom is simply painted in a purple hue, with very little to no decoration, which lets you concentrate and appreciate the craftsmanship of the classic furniture pieces. The floors are engineered wood and paired with light pink painted walls. All furniture pieces are made of solid oak, creating a matching ensemble of furniture pieces. The bed has wooden headboard and blue patterned covers which matches the two pillows on the two stools at the foot of the bed. Beside the bed is a pair of wooden night tables which also matches the chest and the dresser drawers in this bedroom. The most interesting aspect of this modern master bedroom would be its combination of textures. This is a modern minimalist design, using a uniform wengue laminate for all its furniture pieces. While modern design could tend to be a bit boring, this particular design manages to add an interesting touch to it with its choice of finishes/materials. The ceiling is made from raw concrete and kept bare, giving it that signature gray coloring and texture. The gray & silver wallpaper seems to mimic the natural patterns of concrete, giving the walls an interesting finish, and there is also the accent wall, which uses texture metal panels in a rose gold color, creating a similar sheen and pattern as the gray & silver wallpaper, but with added depth and pattern because it is separated in panels. The floors are ceramic tiles with wood-like patterns, running horizontally, while the darker gray area rug breaks this horizontal pattern as its lines are oriented in the opposite direction. This is an interesting modern bedroom which combines lilac with black and white. You will see that the general walls are painted in a light lilac color, while the wall with full length cabinets is painted stark black which makes the ebony wood laminate of the cabinet look light in comparison. All other furniture pieces in the room are in plain white, even the colors, compensating for the heavy look given by the black wall and ebony cabinets. A bedroom with modern Asian design inspiration which combines the minimalist charm of modern design with dark woods and other oriental elements. Floors, walls and ceiling are in white, creating the perfect backdrop for ebony wood. You will see that all wood elements are stained in dark wengue, almost black, but still showcasing the natural texture of wood. Even the door and cabinet doors uses the same wengue stain, which gives a very sharp contrast with the white backdrop. Adding a little texture to the space the are woven abaca panels on the furniture pieces, and to help give the room a brighter feel, yellow was used as accent color. This is a simple modern bedroom which applies classic glam elements to give it that elegant feel. As the space is limited, heavy panelings or wall recesses would just take up space, so to achieve the look, the walls are given special finishes. You will see that the headboard wall and the TV wall have yellow paint base and has brocade and horizontal stripes painted on in a reflective silver color. It also helps that the curtains used are similar – a combination of curtains with yellow base and gold pattern, and a silver base with yellow pattern. The furniture pieces are simple and are all in white, making it easy to blend in with the bold colors and patterns on the walls. An all-white modern bedroom which does not divide the bathroom space with the sleeping area. 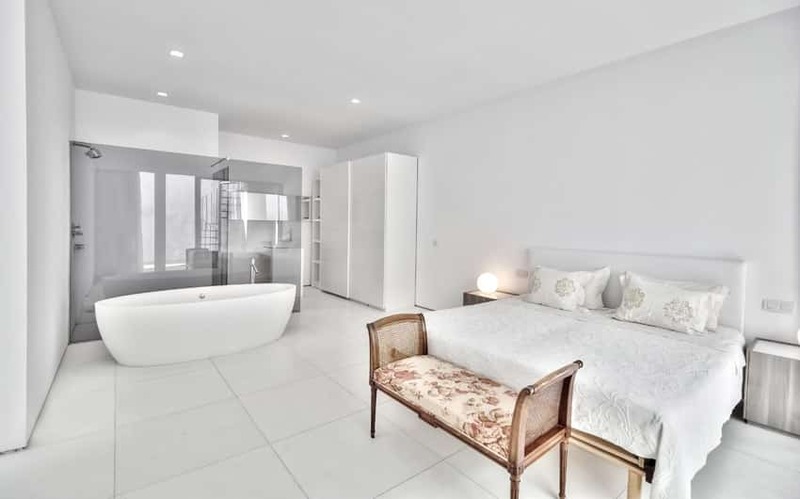 Walls are all white, and since the floors are white ceramic tiles, there is no divider between the bath and sleeping area, and you can see the bathtub just beside the glass enclosure of the shower area. 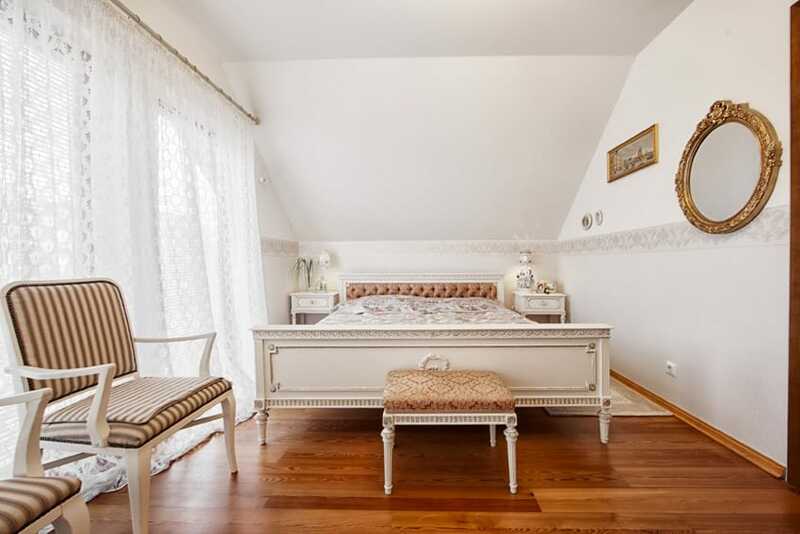 To break the monotony of the all-white surfaces, and interesting wooden bench was placed at the foot of the bed, which has floral upholstery and woven sides. This contemporary style bedroom is noteworthy for its rich wood furniture, laminate flooring and large floor to ceiling windows view. The wall is covered in a large pattern wallpaper design and offers wall lighting fixtures to provide soft illumination. 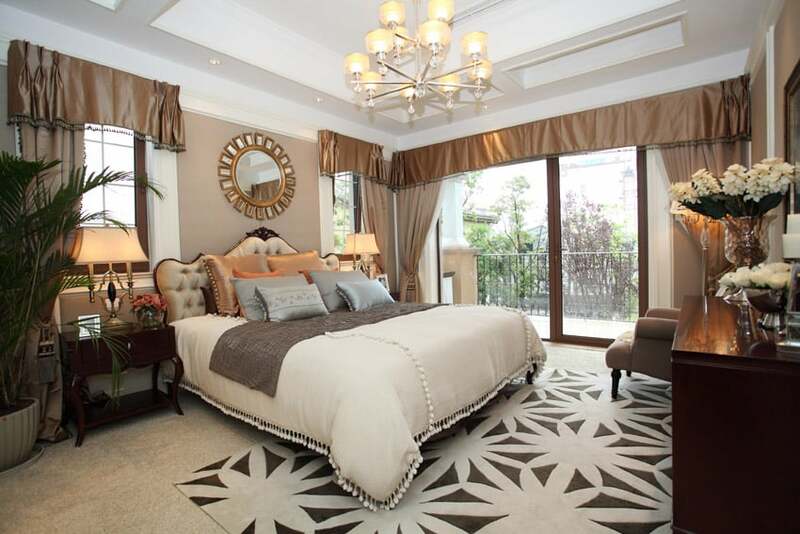 Repetitive square patterns is the recurring element of this modern bedroom. The mirror panels on the accent wall is square, even the brown tufting at the center of the accent wall is made up of small squares. The console table opposite the bed is mirrored, and unlike the usual full glass panels, it uses small square mirror tiles with beveling. The rest of the room is simple and modern – beige walls, mahogany wood flooring, and a simple low bed with leather headboard with the same leather upholstery as the tufted wall panels. 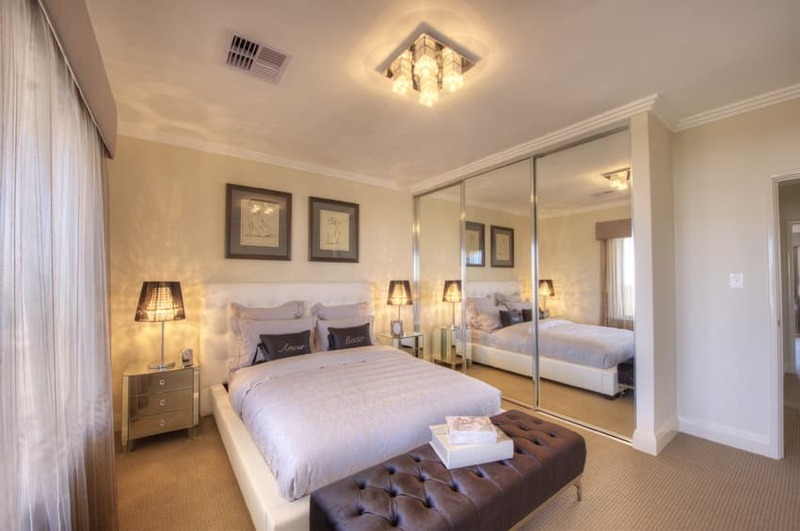 A modern minimalist bedroom which manages to combine masculine elements with glam, through the use of lighting and accessories such as the beveled mirror. 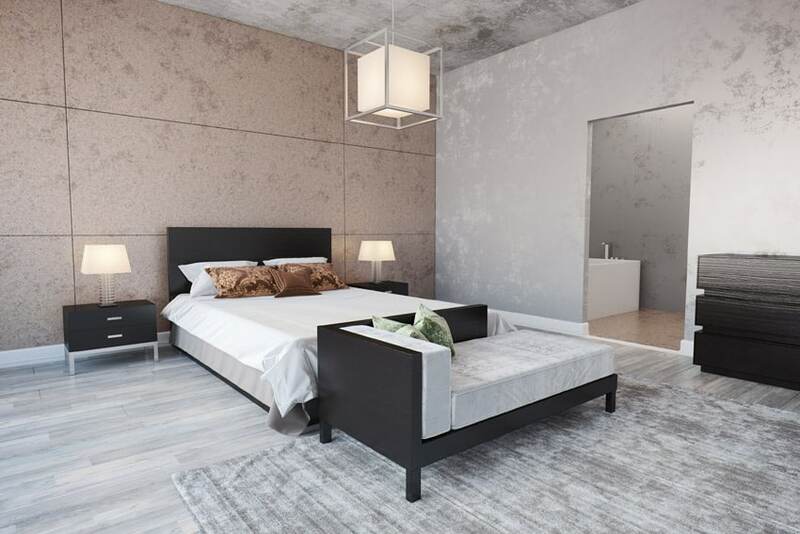 The bedroom in general has clean and seamless surfaces – mahogany engineered wood floors, grays walls with black textured wallpaper for accent, and all-white furniture which stands out from the black and gray surfaces. Because modern designs tend to look a little hard on the edges, the fully upholstered white bed softens it a bit. Reflective surfaces gives a very modern appeal, despite traditional colors or style. In this bedroom, you will see that furniture pieces are traditional in form, but as they are combined with shiny materials like the floors, mirror and stainless steel, it gives it a more modern appeal. A modern bedroom design that has that clean seamless modern aesthetic, combined with Asian design elements. Floors are engineered light maple wood, and walls, while are mostly white, have orange accent panels with wengue framing. The headboard wall has wide horizontal laminated panels which is in the same finish as the wide bedside tables. Above are powder-coated panels in warm gray, and in the center, panels has cherry blossom design, giving it a nice oriental feel. The furniture is a modern four-poster bed in black stain finish, matching the chair at the floor of the bed. This is a modern bedroom which applies classic patterns into its design elements to break the monotony typical of minimalist modern designs. The accent wall for this bedroom is a full wall of mirror with with etching design in classic brocade patterns. This helps add texture to the space, as well as give an illusion of a bigger space. 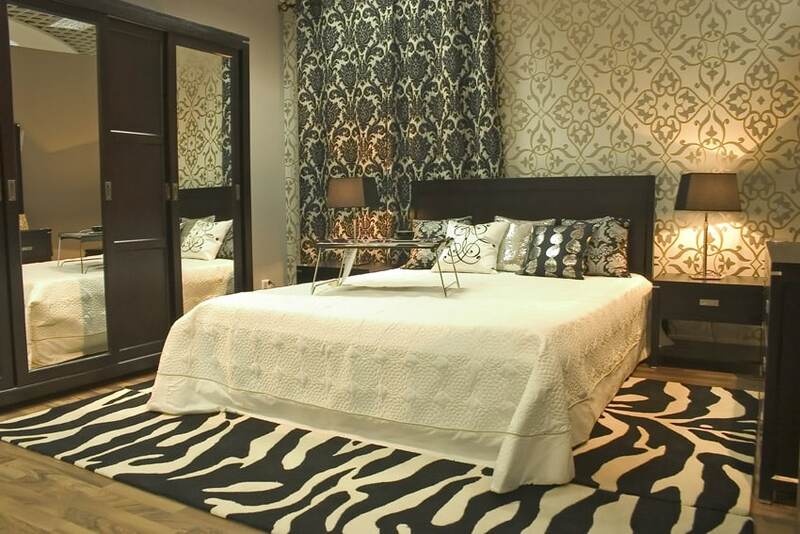 The accent pillows on the simple wengue bed is a combination of black and silver with various patterns to add interest to the plain bed, and on the floor, a large area rug with zebra pattern is placed to give emphasis to the bed area. The rest of the furniture pieces is simple – all in wood and uses the same wengue finish with stainless steel hardware. Master bedroom ideas with two types of wallpaper such as this room can make a big impression and convey your own personal style.